An Post is launching a new postage stamp to raise awareness about organ donation. Organ Donation Awareness Week starts on 1 April but the new stamp will be available nationwide from today. One ambassador for Organ Donor Awareness week is David Crosby, a father of three children, from Co Cavan. Almost four years ago, at the age of 40, David was diagnosed with the serious lung condition Idiopathic Pulmonary Fibrosis (IPF) which three of his siblings died from as children. The disease results in scaring and hardening of the lungs, it is progressive and non-curable. Despite some initial treatment, David's disease got worse and he was told he would have to have a double lung transplant for any hope of survival. In 2016 he had the transplant and left hospital after 13 days. He said his "life was saved by someone whom I will never meet. My Donor. My unknown hero and their family made a brave decision to donate organs. But it is more than that, it’s a gift of life, a second chance and without them I would not be here". Since the operation, David has run two marathons, is training for a third in London in five weeks. His ultimate goal is to run the six world marathon majors with Tokyo in 2020, Boston in early 2021 and Chicago in October 2021. 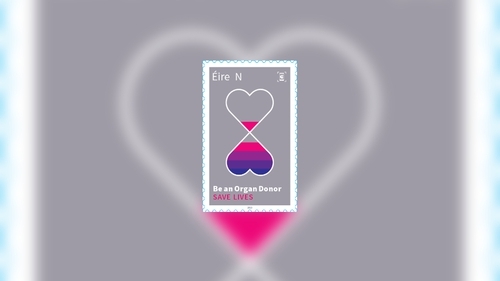 As well as launching a special stamp highlighting the importance of organ donation, An Post is making donor cards available in every post office to encourage people to carry a donor card as well as including the information on their driver's licence. An Post said the stamp features an hourglass timer "to represent the precious nature of time and the gift of life passing from one person to another through organ donation."